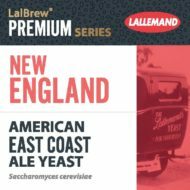 LalBrew® New England is an ale strain selected specifically for its ability to produce a unique fruit forward ester profile desired in East Coast styles of beer. A typical fermentation with LalBrew® New England will produce tropical and fruity esters, notably stone fruits like peach. Through expression of a β-glucosidase enzyme, LalBrew® New England can promote hop biotransformation and accentuate hop flavor and aroma. LalBrew® New England exhibits medium to high attenuation with medium flocculation, making it a perfect choice for East Coast style ales. Fermentation that can be completed in 7 days, a bit slower than most ale strains. This is a normal and perfectly natural characteristic of this strain. Medium to high attenuation and Medium flocculation. 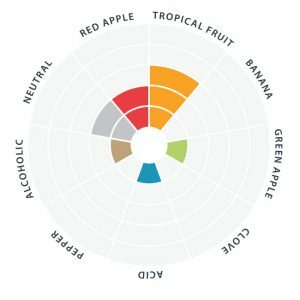 Neutral to slightly fruity and estery flavor and aroma. Lag phase can be longer when compared with other strains, ranging from 24-36 hours.